There’s nothing sweeter than freshly harvested bay scallops. Serve them with creamy pasta and some crumbled bacon for a delightful late fall dinner. Photo by Tom Schlichter. The bay scallops of fall are so tasty and sweet that many people wait an entire year just to ensure their next serving has been freshly harvested. There are dozens of ways to cook and present these tempting morsels, with quite a few calling for the shellfish to be wrapped in bacon. Dressing the diminutive bay scallops in this manner can be a challenging task, however, so here’s a simple way to enjoy your bacon-scallop nirvana with the wrapping challenge removed. 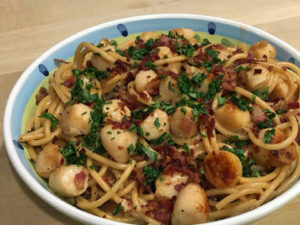 While bay scallops are preferred for this recipe, larger sea scallops can be substituted should the bay variety be unavailable. The larger scallops do, however, require slightly more cooking time. Bring a large pot of water to boil. When ready, add salt and cook pasta for 1 minute less than package directions for al dente. Before draining, reserve 1 cup of pasta water. Drain pasta and set aside. Pat the scallops dry and season with salt, pepper and lemon zest. Place diced bacon in a large, cold skillet and heat to medium. Once the bacon is crisp, remove with slotted spoon and drain on paper towels. Add the butter and olive oil to the bacon fat. Cook scallops in bacon fat mixture until opaque and slightly browned, about 3 to 4 minutes per side. Remove scallops from pan with slotted spoon and toss with juice of half the lemon. Keep warm. Cook shallots in pan with bacon fat mixture with a little salt until opaque, about 4 minutes. Add wine and deglaze pan, scraping all of the bits off the bottom for 2 to 3 minutes. Reduce heat to low. Add pasta, half of the bacon, heavy cream, half cup of reserved pasta water, half cup of parmesan cheese, and toss until all are warmed through. Add more pasta water if the mixture seems too thick. Remove from heat and gently toss in the scallops. Move to a large platter for serving. Top with parsley and remaining bacon, and add remaining ¼ cup of cheese if desired.